Hytrin allows urine to flow freely and relieves the urinary symptoms such as the need to urinate frequently. 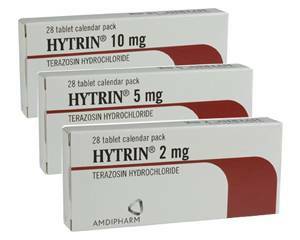 Hytrin tablets contain the active ingredient terazosin, which is a type of medicine called an alpha-blocker. Terazosin works by blocking the alpha receptors in the prostate gland, causing the muscle in the prostate and bladder neck to relax. Hytrin is intended solely for use in men. It is used to treat an enlarged prostate gland (benign prostatic hyperplasia). Hytrin is also prescribed to men prior to prostate surgery and used as a treatment for high blood pressure. Hytrin causes blood vessels to widen, which lets the blood pass more easily through the blood vessels and hence reduces blood pressure. Hytrin should be taken just before retiring to bed at night. If you have forgotten to take your dose, you can do so the next morning. Do not take a double dose to make up for the forgotten one, as this can make your blood pressure drop too low. If you have taken more than the recommended maximum daily dose, you should seek medical advice. Dosage varies per person and is determined by a doctor for each specific patient depending on the seriousness of the condition. The usual starting dose is one 1-mg tablet. After three days, the dose may be increased to one 2-mg tablet. Continue with this dose for 11 days. After 11 days, the doctor will again determine the appropriate dosage (usually 5 to 10 mg a day). If you have not used this medicine for some time, you should start with the starting dose before increasing it. See the package leaflet for a full list of side effects. This medicine should not be used if you are allergic to Hytrin or any ingredient in it, or other alpha blockers. For a complete list of ingredients, see the package leaflet. Hytrin should also not be used in people with a liver function impairment or with certain cardiac conditions. This medicine may cause dizziness. You should take care when performing potentially hazardous activities, such as driving or operating machinery, until you know how this medicine affects you. Alcohol can make side effects such as dizziness worse. It is therefore advisable to stop drinking alcohol while taking Hytrin.